If you fell in love with the voice of Chris Mann last year when he appeared on "The Voice," you will be as excited as me to know that he has a new album, and it is AMAZING! Some of the songs on the album are old favorites. 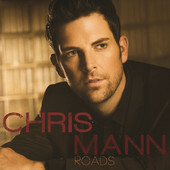 Chris Mann's version of "Ave Maria" is spectacular and amazing! I also love his take on the more modern hit, "Need You Now." You can even hear the voice of his coach, Christina Aguliera, joining him on "The Blower's Daughter." This mix of both old classics as well as original music is a nice reminder of how beautiful his voice is!